Bar Crusher has carved out a pretty impressive reputation in the fishing scene over the years for strong, soft-riding boats. Key to this success has been the innovative water-ballast system that lets you enjoy the benefits of alloy, plus have a great ride. However, Bar Crushers first new five-metre craft throws the water-ballast down the plughole. And the reason is simple. Scaling to a smaller size changes the dynamics of the hull and the purpose of the boat. This is a boat designed as much for estuary fishing as offshore angling. For this reason they’ve gone for a more moderate deadrise hull that doesn’t draw as much water or requires water ballast. We caught up with the new ‘baby’ Bar Crusher in Sydney last October and came away very impressed. It’s not only a great crossover between estuary and coastal fishing needs, but is also exceptionally good value. Value-for-money is a big driver behind the design and the aim is to get a ready-to-fish package for less that $40,000. That’s impressive considering this is no ordinary tinnie and comes with extra expensive plate-alloy construction. Keen fishos will appreciate the practical cuddy deck of the 500CR. Indeed, the CR stands for Cuddy Runabout, meaning the boat has a smaller-size cuddy that won’t intrude into cockpit space as much. This is much better for fishing because you still have enough dry space room to dump your backpacks and tackle boxes. I might mention that the smaller size ‘shed’ also improves the boat’s ‘drift’ rate. Less windage means it drifts slower and this is really helpful when you’re fishing over reefs and want to drift as slowly as possible. The cuddy is still big enough to provide shelter and has twin seat boxes in case you want to pop your head out of the weather. Our test boat was supplied by Blakes Marine, a Sydney dealer that has represented Bar Crusher for a couple of years and is very happy with the brand. The 500CR is actually a bigger boat than the name suggests. It is a 5.4m from bowsprit tip to the end of the motor pod. It feels quite roomy thanks to a 2.15m beam and the side decks being narrowed to free up cockpit space. Reflecting its crossover purpose the Bar Crusher 500 CR has a hull suited to rough water requirements. Beam is carried well forward to ensure good tracking and there’s a deep Vee bow flowing back to a16-degree transom deadrise. This gives the Bar Crusher a bit better rough water ride than you typical tinnie with lower deadrise. The hull also gives you a shallower draft, which is handy when fishing over tidal flats. Other aspects of the boat are pure Bar Crusher, including the attractively raked bow and neat, fastback transom incorporating a central motor pod and a landing deck. The topsides are smooth and clean and wide chine lips ensure spray is thrown low and clean. You don’t get a walk-through transom like the bigger Bar Crushers, however, the transom does have a folding stern ladder for easier boarding. Once aboard you find all the hallmarks of a serious fishing machine. Firstly, there’s a checkerplate alloy floor that is sealed and has foam buoyancy underneath. It isn’t a self-draining floor, however, any water that comes aboard washes into a rear sump where it’s removed by and electric bilge pump. The trade-off is the Bar Crusher has a decent internal freeboard (62cm), which means batter crew safety in bumpy waters. Construction is up to the usual rock-solid standards of Bar Crusher. You get plate alloy 3mm sides and 4mm bottom panels backed by fully-length longitude stringers and welded cross frames. This makes the 500CR an incredibly strong unit and a craft likely to stand up to decades of hard work. Quality of construction also extends to superb paintwork and standard fitment of hydraulic steering and tinned wiring. You also get dual batteries and a master isolator switch. With hull weight of about 580kg the Bar Crusher 500CR is an easy package to tow behind a medium-sized car. The total trial weight is about 1100-1200kg loaded with fuel. That places this Bar Crusher comfortably within the range of cars like the Honda CRV wagon. Launching our test boat into the smooth waters of Pittwater, we were impressed with the ease 500CR slips off the trailer. I was also very impressed with the way the new Yamaha F70A four-stroke fired up first go and idled so quietly you’re hardly aware it’s actually running. A lot is made of the fuel saving with the four-strokes. However, what you really notice in boat tests is just how much more pleasant they make the boating experience. It is nice to have a smooth, quiet, smoke-free motor after putting up with noisy motors for many years. Throwing the 500CR through a series of high speed turns also proved how well-balanced the hull is under pressure. Noticeably, it doesn’t need a lot of trim adjustment in the turns so it’s a very easy boat to drive. Hydraulic steering makes for a nicer driving experience and is another great feature of the Bar Crusher 500CR. I like the helm station and found it gave me plenty of room to steer from the seated or standing position. The 500CR is certainly very stable underway and also at-rest. So it’s going to be well suited to either stand up lure-casting, or traditional bottom bouncing. The Bar Crusher is rated for a maximum of 90hp, however, as our test proved, it gets along pretty nicely with a 70hp motor. And it’s no problem with a four-stroke because the pod transom is designed to carry the added weight. Not that this is a very heavy motor because the new generation Yamahas are much lighter in weight. If you want a bit more grunt, go for the maximum 90hp power. The boat should really get up and fly with those extra horses and easily do 36 knots tops speed. We didn’t have the conditions to bother going offshore, however, I’m confident the 500CR is going to be happy out there. In the occasional ‘bump’ we encountered it sliced through nicely. You won’t go short on fuel either because the Bar Crusher has a 90-litre in-floor fuel tank. You also get a fuel deck filler, sender kit, and water trap fuel line. In typical Bar Crusher fashion you get an anchor bowsprit for easy anchoring plus a small split bow rail. The former is designed to accommodate a Sarca anchor, which is a self-release model that comes from Victoria. Up front there’s also a self-draining anchor well and twin mooring bollards for anchoring, or for mooring at the marina. There is also a large side-opening forward hatch that gives safe, easy access to the anchor position from the cabin. It’s really easy to work the anchor from the cab because you have a clear standing space directly below the hatch. This is because the builders cleverly use short seat boxes in the cabin rather than the traditional Vee berth that chews up space. Moving back we find a low windscreen with toughened glass panels. Behind this is a dual pedestal seat sitting atop storage boxes. The seats can rotate to suit fishing needs and there is a grab rail for the passenger. The cockpit is a great work area and gives you good toe-under space between big and useful side pockets for your fishing gear. There are also three cast alloy rod holders down each side and a raised cutting board at the stern. The open-back cabin will be a good place to stow your tackle boxes and whilst headroom is on the low side, it’s a comfy spot to escape the weather. Upholstered seat cushions are also included too for added comfort. Meanwhile, the helm dash provides room to fit motor gauges and comes with a switch panel for the electrics. It goes without saying the 500CR is a great package for fishing. 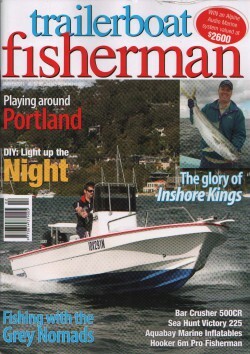 It’s going to be right at home snapper fishing in Port Phillip or chasing mulloway in Sydney estuaries. The checkerplate floor provides really good foot grip and a practical, easy to wash-out interior. All you need t add is the sounder/VHF radio electronic package and you’ve got a really decent fishing rig! The Bar Crusher team has gone after the entry-level fishing market with this rig and done it well. It’s certainly a trailer boat that’s well suited to estuary, or inland lake fishing besides being handy for the odd close-costal fishing trip. The all-rounder approach will suit the bloke buying his first serious trailer fishing boat, but keeping to a budget. Indeed, it could be the only boat he will ever need because it’s so well built and will look after family boating. About the only drawback for family use is the lack of cockpit seating. However, this can be solved with optional seats that slot into the back and sides of the cockpit. You can add seating for upwards of four people thereby keeping the tribe happy. Best of all the 500CR hits the right price point and is easy to tow and park at home. The price of the test boat with braked single-axle trailer, Yamaha 70hp four stroke, K series propeller and inshore safety pack was $39,990 at time of testing.